When you are left with many scars on your body, made by your own roaming hands, a legitimate question a skin picker asks is “Will someone ever love me for who I am?” Not only do we worry about being judged by a partner on our damaged complexion but we fear the response to the explanation of, “I can’t help it… I have a skin picking compulsion“. For anyone who worries about never finding love based on this Body- Focused Repetitive Behavior (BFRB), I am here to let you know that this disorder does not stop you from finding love; it can happen even when you give up hope of never being accepted. On April 15th, 2010, I started dating a man who I met online; this is usually the beginning of a disastrous tale, but let me assure you it has been the complete opposite. As someone who doesn’t go socializing and prefers to keep to herself, the idea of “putting myself out there” is far beyond intimidating. On top of social anxieties, I have this grand ole’ daunting disorder that usually takes a full lecture for someone to comprehend… so I hate dating. In fact, the “honeymoon” stage in my relationship had been a bundle of uncertain anxiety with me waiting for the rejection. To my disappointment, the first meeting was awkward. We met up again the next week, which was equally as awkward… which included me exclaiming, “You better not be trying to move in on me!” while we were watching a movie together on his couch and his elbow accidentally brushed up against mine. As you can tell, I am really a charm to have a date with. Anyway, I decided to hang out with this green-haired fellow one more time, but this time it was to tell him that we should just stay friends. When he arrived at my home to pick me up, something was different about him. He was more relaxed, more at ease, and he was opening up emotionally. I felt the attraction to him and believe I did the whole time, but automatically swallowed that emotion in our previous meetings, like I do all other potentially nerve-wracking emotions. I had been hurt, rejected, under-appreciated, treated like crap, lied to, manipulated, and put down in my past relations with people, some of which had been in romantic relationships so it lead me to the conclusion that I have a real knack for becoming close to those who like to drive daggers in my back. To rewind a bit you must be wondering how I decided to tell Jason, the green-haired shy guy about having this disorder. I felt I had no choice between wanting a fully honest relationship… and publishing FOREVER MARKED: A Dermatillomania Diary just 5 months previous to us meeting. I am someone who would rather be alone than in a relationship that makes me feel alone, so I had to let my lil’ secret loose. I don’t remember how I approached it in this case, but looking back I would say the safest bet to opening up about this condition is to begin by talking about mental illness, later specify a conversation surrounding OCD, then go for the kill. When Jason accepted my Dermatillomania, I couldn’t help but wonder, “Oh God, is he that desperate?? ?” My insecurities sound intense, but they really weren’t as severe as they were before… I just have “criteria” that needs to be met at the beginning of any relationship or else I’ll sever it in one swipe. Unfortunately, my Borderline trait of “all or nothing” tends to apply to my interpersonal life so I looked for imperfections and signs that Jason wouldn’t stick around. They never came. Instead, I grew closer to a man who loves me unconditionally. I became best friends with a man who knows my thoughts without me expressing a word (I’m slightly cold and able to hold a poker face). I became lovers with a man who is unafraid to touch my skin. He has revived the spunky, silly, and lively part of me that I thought died when my father had his brain injury back in 1997. I have met my life partner who has the ability of making me laugh at least 3 times a day, even when things are stressful… and even if he doesn’t get home until 11pm. Jason not only supports me, but he encourages me to continue my advocacy and awareness for Dermatillomania. With his career being in web developing, he created this very website for me and even took on a designing role (not a part of his expertise). He designed my business cards for me, used his computer skills to update my original copy of FOREVER MARKED awhile ago, and uses his Facebook page to tell others of my successes when he doesn’t even use Facebook. He also took part in a photo shoot for me because I wanted one that showed the world that scars don’t deter true love, which can be seen below. There is something so unique about him (that doesn’t include the hair!) that can rarely be found anymore- pure kindness. He has an innate compassion and kindness that no one can ever steal away and these are a few of his traits that make me fall deeper for him every day. I don’t want to think about what my life would be like if I had played the “let’s just be friends” card at our 3rd meeting. The thing is, we are so alike that we both had our defenses high and weren’t exactly smooth in our ways of “hitting on” a potential mate. What I do know is that I would relive everything in my life that devastated me tenfold if it meant that Jason and I would end up together in the end. If the illogical situation rose of going back in time and choosing having Dermatillomania and Jason VS. not having either, I would choose having both. True love is not something that happens often but it is worth years of suffering to finally have. 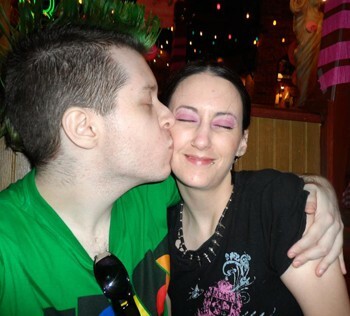 From a skeptic of relationships and someone whose Dermatillomania almost ended her life at 18 from the despair and mental anguish it caused daily, I think my decision to relive it all if it meant having Jason portrays my feelings clearly on how much I love him and cherish every day we are together. In 5 days, we will be celebrating our third anniversary with two of those years living together. It’s incredible because we still feel like a new couple in that fun sense, minus the awkwardness and insecurities that accompany a fresh relationship. It feels like we have only been together for about a year, yet it also feels like we have experienced a lifetime together by how parallel our thoughts are and how we view the world. When I’m with him I tend to act goofy just to see him grin ear-to-ear and see those lines emerge around his intricate blue-and-yellow eyes, which I love now and will love when those lines become permanent when we are grey-haired and retired. PPS- On April 15th, 2014 Jason and I became a married couple! Wow. I’m late to this, but I found the link through a comment you made on an HPost article. And I had no idea this was a real condition, but this is what I have. I actually cried reading this article. Since I was a child, I’ve picked at my skin. My parents would always tell me to stop and the like, but my hands always found their way back. I still do it, obviously I can’t control it and I could never figure out why. It’s especially bad if I’m reading. I’ve never been diagnosed but I just assumed it was a part of my anxiety. But even on medication I can’t stop that. I’m 29 years old and I’ve finally been able to accept the fact that my skin has scars and there is nothing I can do about it and have started to embrace my body. It’s hard, especially dating. I’m currently single, and I know whenever a boyfriend seems my arms and shoulder and then my back, the eyebrows go up and the questions want to come out, but they never do. Thank you for this. It’s really what I needed to read right now.